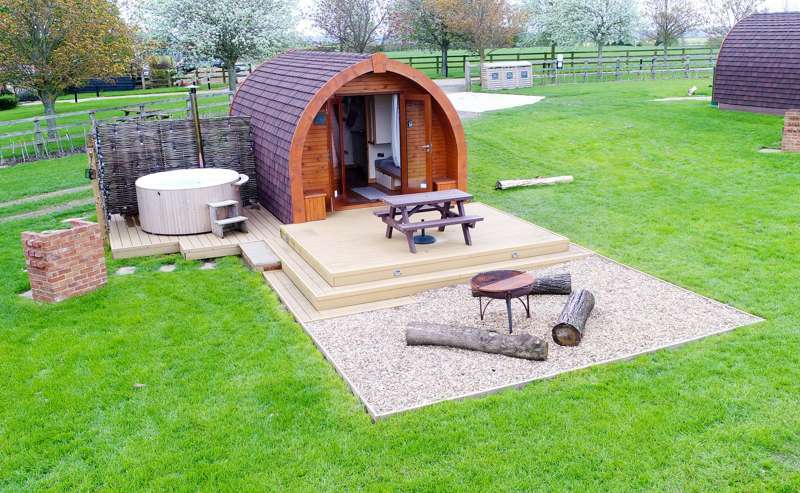 Ultra-luxurious family-sized glamping pod just half an hour from London. Our Willow pod comes with a hand-made Scandinavian wood-fired hot tub, which can acommodate four people. The Willow pod is well-insulated, and comes with thermostatically-controlled heating, all the pods are are equipped with a seated dining area, which converts into a comfortable double bed, and a sitting areas, in which two sofas convert into two further single beds. As well as the well-equipped en-suite bathroom, the pods have a fully fitted kitchen with fridge freezer, electric hob and electric fan oven. A smart-TV and free Wi-Fi is also ready available. Please note; bedding is not included, guests may bring their own bedding or order it at an extra cost. Glamping only. Couples, families, groups, dogs – yes. Tents, campervans, caravans – no.